I’m going to start this by admitting that this is the VERY first time that I’ve ever made my own chicken broth. I’ve been meaning to for years… and it’s almost hypocritical of me not to, but for some reason I never got around to trying it. So what was my experience? OMG, so easy. Seriously, dump it all in the pot and let it go. Come back later and you have a magical golden liquid full of flavor and good for you nutrients. Why wouldn’t you want to do this?! Plus, I always get warm and fuzzy inside when I know that I’ve reduced my waste. By making broth you get to use every last bit of goodness in your chicken and vegetable scraps. I can’t wait to make some vegetable broth too! 1) Save your vegetable scraps from other recipes in the freezer until you’re ready to make broth. Just make sure they’re well washed first to remove sand and dirt. 2) Theresa suggested making the broth in a slow cooker instead of on the stove top for even less baby sitting. Let it go all night and you’ll have an ultra-amazing broth by morning! I can’t wait to hear everyone else’s tips! 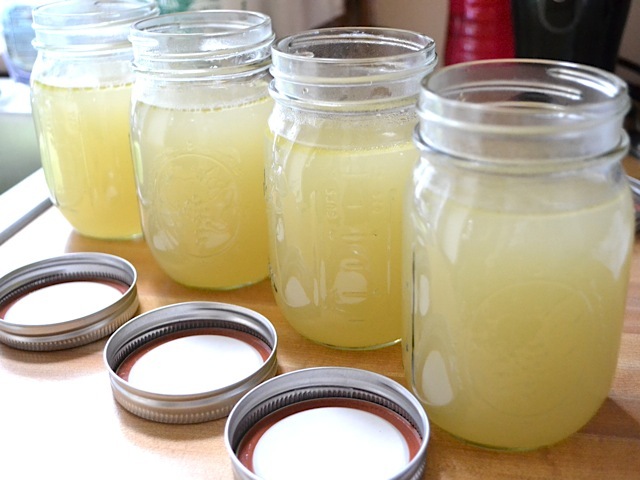 How to make your own homemade chicken broth using scraps from other recipes. Pick the skin from the chicken carcass and make sure you’ve gotten all of the good meat off. 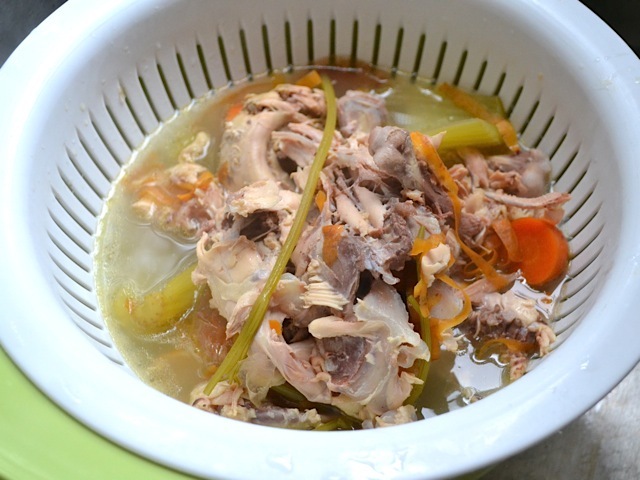 Leave the cartilage as this will “melt” into the broth, adding flavor and nutrients. Yes, cartilage has nutrients. It’s like taking a joint supplement pill, but it tastes better. Make sure your vegetable scraps are clean by rinsing well with cool water. You can use the ends and stems of carrots, celery, herbs, onion skins, or any piece of a vegetable that you normally cut off and throw away. The vegetables WILL effect the flavor, so make sure you use vegetables that “go” together. I used celery, carrots, parsley stems, and onion skins. 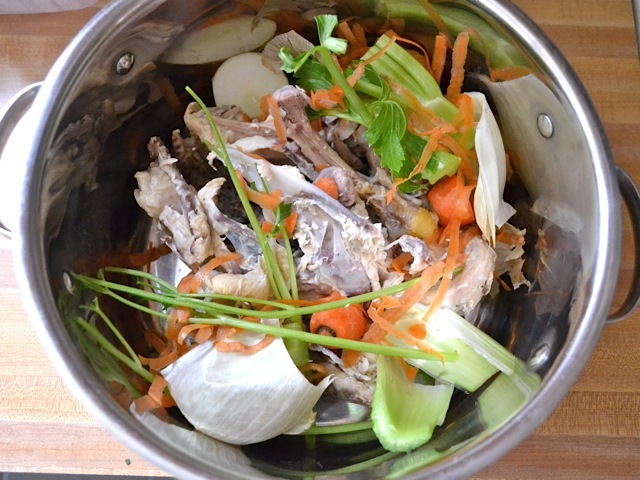 Add the chicken carcass and vegetable scraps to a large pot and cover with water (about 12 cups, depending on how big your chicken was and how many scraps you have). Bring up to a boil over med-high heat, then reduce to low and let simmer with a lid for 3-4 hours. After simmering, pour the broth through a colander into a large bowl or pot. Remove the colander and throw away all of the scraps. Cover the colander with a cheese cloth or another clean, lint-free cloth and pour the broth through once more to remove small particles. Divide the broth into smaller containers to help facilitate cooling. Refrigerate until cold and then transfer to the freezer, remembering to label and date each container. 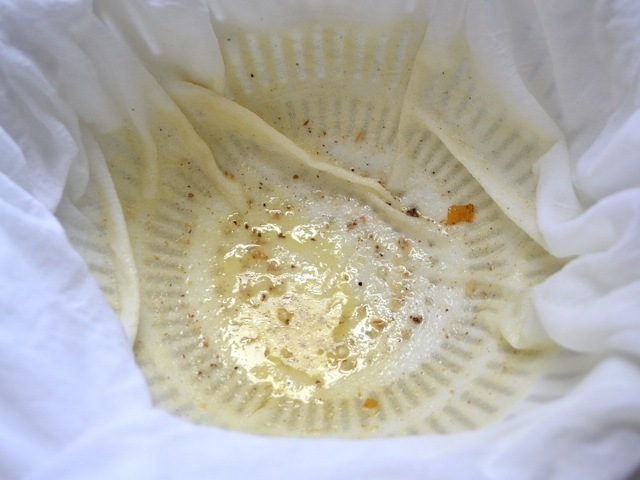 NOTE: While cooling in the refrigerator, the fat will rise to the top and harden. It can be removed at this point if desired, but I find that it adds a great deal of flavor. 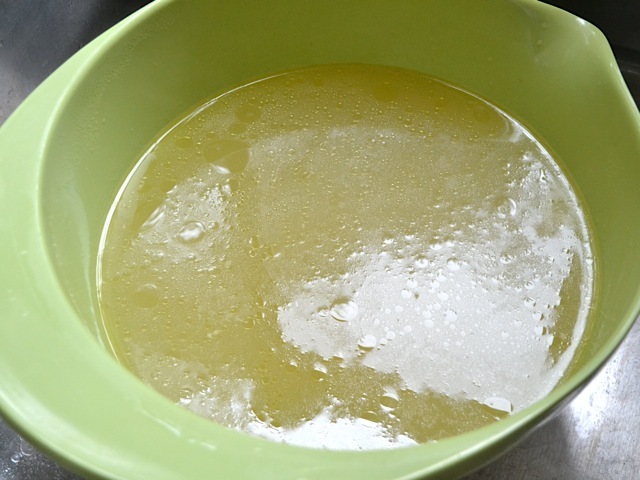 If your broth thickens or gels after refrigerating, don’t be afraid. That is normal and a good sign that you got all of the flavor an nutrients from your chicken! 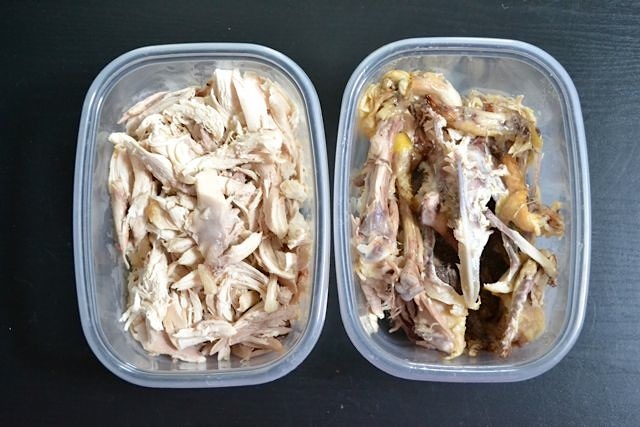 So, I roasted a whole chicken in my slow cooker last weekend, and after it was cool enough to handle I picked the meat off and saved the bones and scraps until I was ready to make the broth. 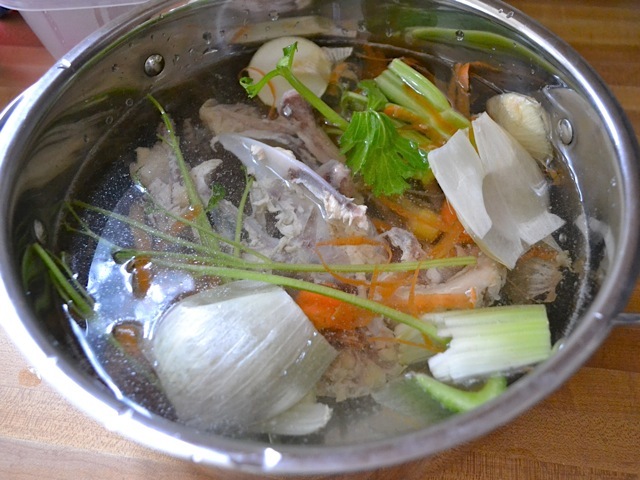 The next day, after I had accumulated some vegetable scraps, I started the broth. First things first, make sure the vegetable scraps are CLEAN. Sand in broth is not good. I had celery tops and stems, carrot ends and peels, onion peels, and some parsley stems. Place them in a large pot along with your chicken carcass. Cover the whole thing with fresh water. I used 12 cups. Bring the pot up to a boil over medium-high heat and then reduce it to low and let simmer (with a lid) for 3-4 hours. After you’ve simmered all of the goodness out of your scraps, it’s time to strain out the magical golden liquid. Place a colander over a large bowl and pour the whole pot through it. Discard the collected scraps. After the first strain, this is what I had. It’s already golden and beautiful. And it smells delightful too. You’ll want to strain a second time through a fine weave, lint-free cloth to remove any small particles that may have passed through the colander. I just laid my cloth out over the colander and poured through again. It didn’t catch much, but I bet if I had simmered for longer everything would have broken down more and there would be more small particles. You can season your broth at this point with salt and pepper, but I prefer to leave it unsalted and then just add salt later when cooking with the broth. Adding salt at the end of a recipe allows you to use less and achieve the same flavor punch. Also, it’s always a good idea to divide your broth (or any food) into smaller containers before refrigerating so they cool down faster. Always chill the broth before placing it in the freezer. I put my broth in jars because they were sitting there on my counter, but I like to freeze sauces and liquids in quart sized freezer bags. You can freeze in glass jars, but make sure to leave room for the liquid to expand as it freezes, or else your container will burst. Just wondered whether i should use chicken skin when making broth. I mean when it’s not very seasoned as when baking bone in breasts for shredding chicken to keep in the freezer. I know fat makes for good flavor but will it be too fatty if I use the skin? It will definitely have quite a bit of fat if you use the skin. Whether that is “too much” is probably a personal preference. I also do mine in the crockpot. Not only no babysitting, but if the chicken scraps don’t boil, the resulting broth with be clearer. I add herb. Usually bouquet garni ( rosemary, sage and thyme). If I want to use the broth for asian style soups, I add star anise, ginger, garlic clove and if I have it a piece of lemon grass. I do this style of stock from veggie scraps and bones regularly and thought I would add that you can also save garlic skins and the main “root” with your scraps in the freezer. Adding that garlic flavor to the stock really kicks it up a notch. Bonus if you throw in a bay leaf! I like to include yellow onion skins with the onion which gives the broth such a rich color. I also add celery but I don’t care for carrot….too sweet for me. 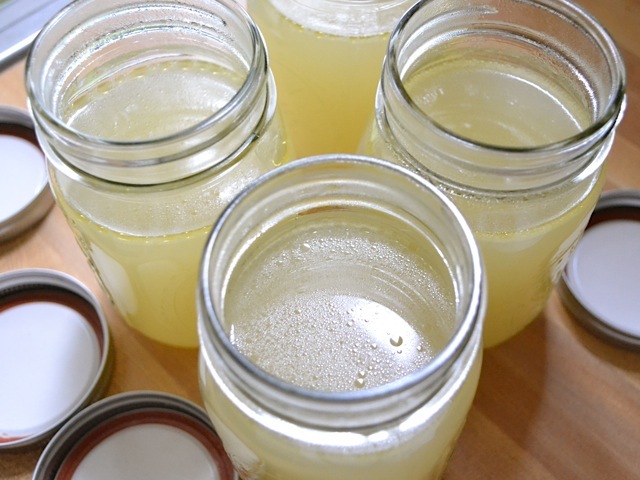 When making broth, I put it in glass jars and I add a spoonful of unflavored coconut oil. 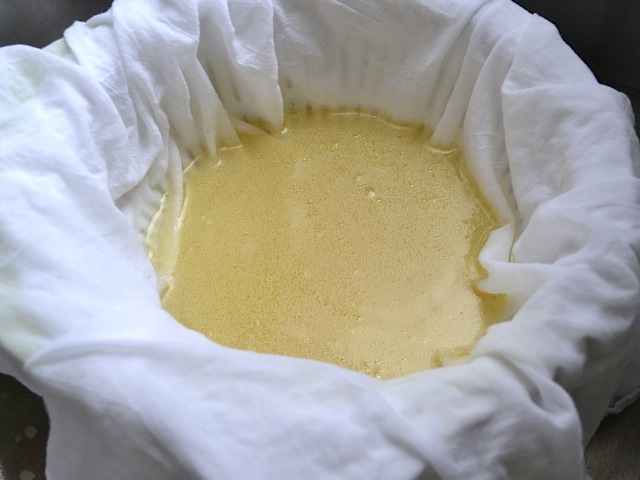 While it cools in the fridge, the oil solidifies on top (make sure it is thick enough) and seals the broth. It keeps much longer this way. (However, if I wanted to keep it for a very long time, I would freeze it). When I need broth, I break the seal with a knife and use the oil to cook something else. I have a very small freezer, so I tend to boil down my broth to about 1/4 of liquid thats left after I take out the chicken and veggies. This way I end up with less volume, but a highly concentrated broth- I just add more water when cooking with it. Can you tell me what setting (low/high) and how long you would leave this in the slow cooker for? I make (and use) huge quantities of homemade broth. I only buy whole chickens and cut them up for use as breasts, thighs and (occasionally wings). I collect all the chicken backbones (often wings) and “extras” (livers, hearts that come in the bags) and freeze them in a 1/2 gallon freezer bag. I add to that bag until its full. Start another bag etc. When I need broth I use a couple of full freezer bags as my chicken source. I typically add a couple of whole onions, a head of garlic, 6 or 7 carrots, some dill and parsley. I need a very large pot! I definitely second adding the pan drippings, it adds *so* much flavor. Well worth the extra fat, since it all solidifies in the fridge overnight and is easily skimmed off. Also, if you’ve saved the giblets, those can go in too (except the liver). Love your blog, by the way, it’s nice to see someone sharing delicious recipes for people who are watching their budgets – and who isn’t, these days? Adding in some whole peppercorns, fresh thyme, and fresh parsley really adds some awesome flavor! Does anyone have a rule of thumb about how old the chicken you use to make stock/broth can be? The reason I ask is because I was wondering if it would be safe to use the left-over rotisserie chicken that’s been my refrigerator for about 1 week, 2 days; and some of the bones got left out on the counter for 3+ hours. Would it be safe to use any of this for making stock/broth? Thanks! I wouldn’t use either of those items. General FDA food safety guidelines suggest not consuming any cooked food that has been at room temperature longer than 2 hours because that is enough time for bacteria to grow and produce toxins that can not be cooked out if reheated (or made into broth). The chicken in the refrigeratore, while not likely to have those toxins because it’s been refrigerated, is more likely to have other growth, like yeast, mold or other bacteria, that can produce off flavors. Neither of these things are guaranteed to happen, but it’s better safe than sorry. A good way to save items like this for making broth is to freeze them. Just make sure to freeze them right away and not let them hang out in the fridge for a while or on the counter top. That way you can save them for a few months until you’re ready to make the broth. Make sure to add some lemon juice or vinegar to help extract the calcium from the bones. I keep a stash of scraps in my freezer for stock – chicken necks, onion tops, tomato trimmings, corn cobs, green bean liquid… When I have a carcass it all goes in the stock pot.